The Reds opening day ceremonial first pitch was thrown by Cincinnati Reds Hall of Fame member Eric Davis, at left, with Reds Hall of Fame catcher Johnny Bench, center, behind home plate. 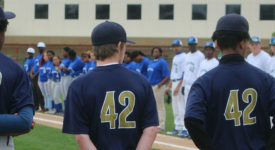 Another Reds HOF member who was honored was the great second base player Joe Morgan, at right, who was named the honorary captain for the day. 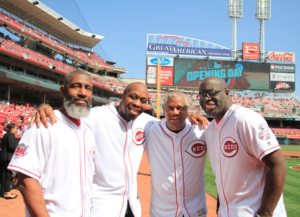 The Cincinnati Reds played the first professional baseball game in Cincinnati 150 years ago, and the 2019 Reds began their 150th season with fanfare and a big 5-3 win over the Pittsburgh Pirates before more than 44,049 fans at Great American Ball Park. 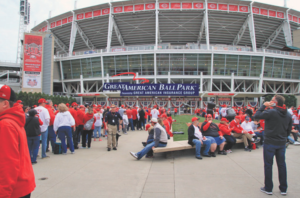 Fans gather outside Great American Ball Park for Opening Day, March 28. Opening Day began with the largest Reds opening day parade in Cincinnati and with thousands gathering just outside the ballpark waiting to enter the stadium. Ohio Gov. 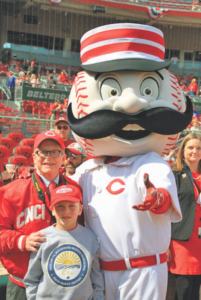 Mike DeWine and Parker DeWine pose with Mr. Redlegs on Opening Day. Following batting practice, the activities started with a military appreciation honoring the crew of the USS Cincinnati from Ohio Governor Mike DeWine and Kentucky’s Governor Matt Bevin. 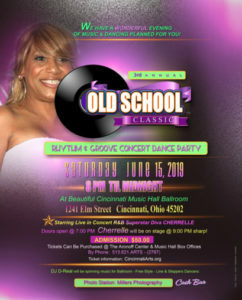 The National Anthem was sung by local group, The Mistics, and there were tributes to Reds’ African American legends Chuck Harmon, the first African American to play with the Reds, and Frank Robinson, as well as other players in Reds’ history. The ceremonial first pitch was thrown by Cincinnati Reds Hall of Famer Eric Davis, with Reds HOF catcher Johnny Bench behind home plate. 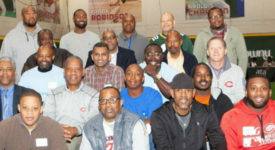 Another Reds HOF member who honored was the great second base player Joe Morgan, who was named the honorary captain for the day. Local entertainers, The Mistics, sang the National Anthem to open the Red’s 150th season. 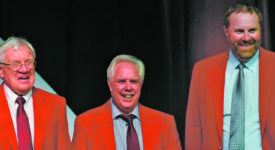 From left are Kenn Godfrey, Darryl Haley, David Godfrey and Mike Haley.